We just love surprise balls and have used Not Martha’s tutorial to make many of them. But then we thought why not make heart-shaped ones for Valentine’s Day. We found all these great little trinkets to wrap up and used a cardstock heart for a little message, as well as to help with the shape. Stickers, badges and shaped erasers are also fun things to include. 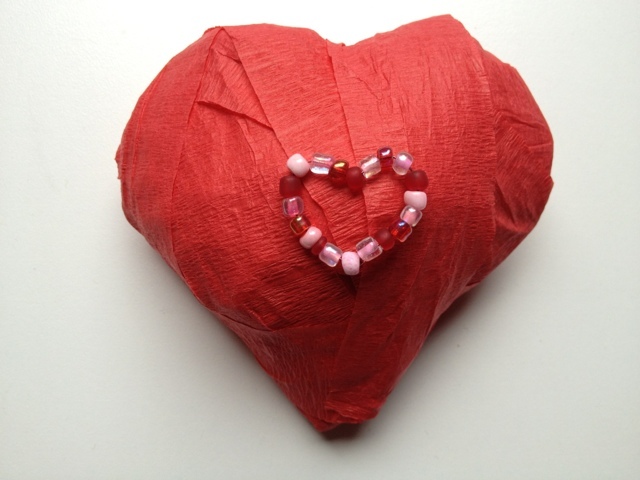 Take a trinket and start wrapping with crepe paper. We recommend having the items follow the shape of the heart. For example, we kept the ball in one of the rounded areas and the flat side of the bear and the popper were kept flush with the flat edges. Keep adding items and continue wrapping. 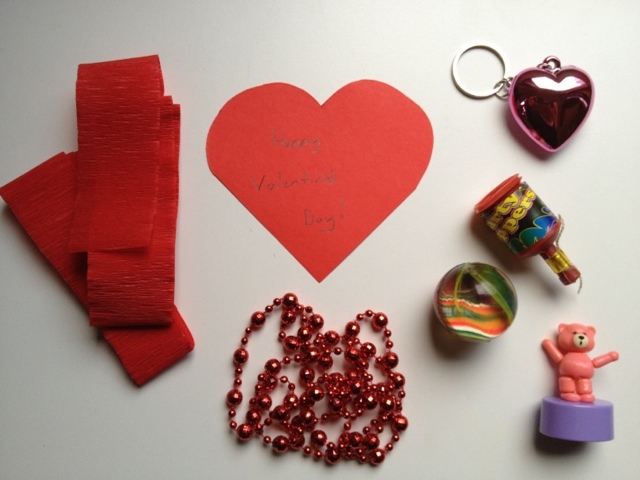 Try to space the items out so the surprises keep coming as the heart is unwrapped. You’ll have to keep shaping/shifting items a bit as you go along to keep the heart shape. Since we used some odd-shaped pieces, we wrapped them tissue paper to help with the shaping. 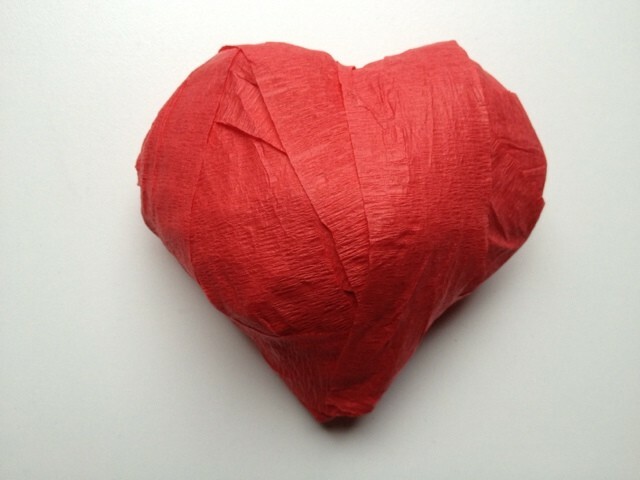 When you’ve finished wrapping up your surprise ball, just use a little glue at the end of the crepe paper to secure. 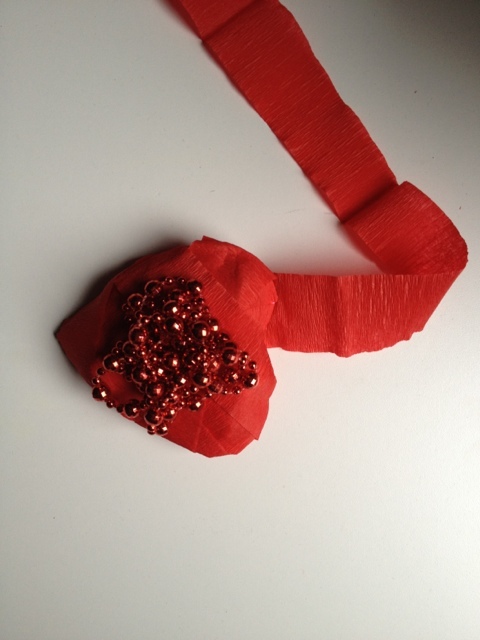 We finished ours by tucking in the edge and adding a little heart we made with beads and some wire. You could also use a little sticker or just leave it plain. Neat idea! I’ve made the regular round surprise balls but this is a fun update for Valentine’s Day.